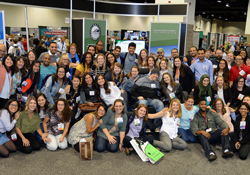 The On To the Future Program (OTF) is a grassroots initiative of the Geological Society of America (GSA) that addresses the organization?s overall strategic commitment to building a diverse geoscience community by engaging groups traditionally underrepresented in the geosciences. The OTF Program awards partial travel scholarships to undergraduate and graduate students, and recent graduates studying in the geosciences, to attend their first GSA Annual Meeting. At the Annual Meeting, students are matched in a one-on-one relationship with a meeting mentor. Mentors guide students during the meeting, share their professional and personal experiences in the field, introduce their mentees to their network, familiarize them with GSA?s structure and governance, and help them understand the unique opportunities for students to participate in GSA leadership.